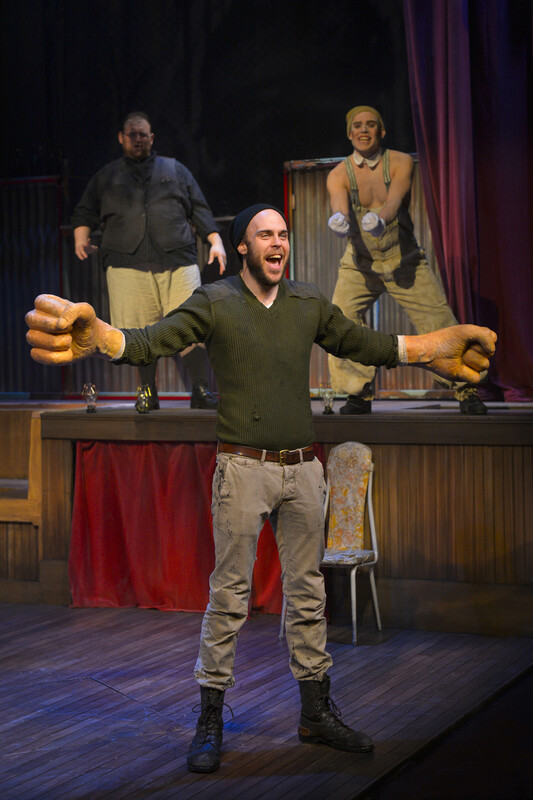 Big Joe (Ian Merrigan) finds his strength — and really big fists — in “The Unfortunates,” playing at A.C.T.’s Strand Theater through Sunday, April 10. (Background, L-R: Arthur Wise and Eddie Lopez). Photo by Kevin Berne. “The Unfortunates” (first performed last year at the Oregon Shakespeare Festival) is the heroic story of Big Joe, a soldier who must learn to use more than his fists if he is to save his lady love and gain his own soul, but it is much more than that. It is told as a journey through a surreal underworld (represented by the mythological St. James Infirmary to which Joe must go down) where he encounters mythological figures from traditional American music, such as Stagger Lee. The show looks, incredibly, like a graphic novel come to life. Musically, it is all over the map of Americana, from blues to rap to torch song to gospel and more. The choreography is thrilling. “The Unfortunates” is likely to be among the most memorable shows you’ll ever encounter. The first scene takes place in a bar where several young men are recruited to be soldiers. The style is presentational with echoes of agit-prop and Brechtian alienation effects, but as the scene transfers to a battlefield the show morphs into something much more unusual and startling. Big Joe is unhinged by the battle deaths of his companions, and returns to a civilian world that is surreal and dreamlike, feverish, and full of hallucination. His war experience and the brutal death of his friends have hurled him into a hero’s journey in pursuit of his own soul, a journey which seems to be both in this world and some other, parallel, dream like universe. Characters cease to be realistic, but become archetypal figures in a ghostly morality play. Big Joe’s war comrades reappear as singing and dancing zombies. A mysterious plague attacks his girl and he must attempt to rescue her. But his hands, since the war, have become nothing but giant fists (literally) which he cannot open or use for peaceful purposes. Along with the zombie soldiers, Joe is haunted by archetypical figures including a mad doctor (Ramiz Monsef), a wild-eyed preacher (Arthur Wise), a Madame (Danielle Herbert), Koko the Clown (Eddie Lopez), and Handsome Carl (Amy Lizardo). As his romantic interest, Rae, Lauren Hart is suitably appealing, vulnerable, and haunting. Every cast member deserves to be called out for excellence. Joe’s journey is deeply moving and engaging, and strikes one as archetypically human, but it does not follow a conventional narrative arc. It is more like a series of hallucinations, each revealing another aspect of Joe’s very human condition, and his search for some sort of salvation. It all hangs together wonderfully well thematically, visually, and musically. Every detail of this production satisfies and works together to create an astonishing organic whole: costumes, set, choreography, direction and music. Kudos to director Shana Cooper, musical director and orchestrator, Casey Hurt, choreographer Erika Chong Shuch, and designers Sibyl Wickersheimer, Katherine O’Neill, Russell H. Champa, and Brendan Ames. This production deserves to be nominated for every award in the book. Get your tickets early; this one is likely to sell out. “The Unfortunates” plays at ACT’s Strand Theater through April 10. For further information, click here. “The Unfortunates” by Jon Beavers, Kristoffer Diaz, Casey Hurt, Ian Merrigan, and Ramiz Monsef. Director: Shana Cooper. Musical Director and Orchestrator: Casey Hurt. Choreographer: Erika Chong Shuch. Scenic Designer: Sibyl Wickersheimer. Costume Designer: Katherine O’Neill. Lighting Designer: Russell H. Champa. Sound Designer: Brendan Ames. Coughlin/Rook: Jon Beavers. Roxy: Lauren Hart. Rae: Taylor Iman Jones. CJ/Rook: Christopher Livingston. Handsome Carl/Rook: Amy Lizardo. Koko/Rook: Eddie Lopez. Madame: Danielle Herbert. Big Joe; Ian Merrigan. Enemy Soldier/Stack/Doctor: Ramiz Monsef. Preacher: Arthur Wise. Posted in Reviews.Tagged A.C.T., Casey Hurt, Charles Kruger, Erika Chong Shuch, Ian Merrigan, Jon Beavers, Kristoffer Diaz, Ramiz Monsef, San Francisco bay area theater reviews, Shana Cooper, Strand Theater, The Unfortunates, theatrestorm. they won’t be wanting for audience, for sure. Five star review–entirely readable.